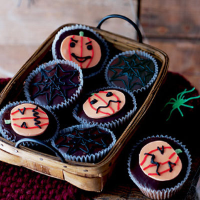 These chocolate cupcakes, decorated with pumpkins and spiders’ webs, are ideal for enjoying at Halloween. Preheat the oven to 180°C, gas mark 4. Place 22 paper cake cases in bun tins. Using an electric hand whisk, beat the butter, sugar and vanilla together for 4-5 minutes or until very pale and creamy. Gradually add the beaten egg then sift in the flour with the baking powder and half of the cocoa. Using a metal spoon, fold in carefully. Half fill the paper cases with the mixture. Place in the oven and bake for 20-25 minutes until the cakes have risen and the tops spring back when pressed lightly with your finger. Cool on a wire rack. To make the chocolate icing, melt the butter with the remaining cocoa in a bowl placed over a pan of simmering water, or microwave on high for 1 minute. Add the milk and 225g of the icing sugar and beat until smooth and glossy. Place a little of the icing on each cake and smooth with a round-bladed knife dipped in hot water. To make the orange icing, blend 15g red and 125g yellow icing with the remaining icing sugar. Roll out, then cut out pumpkin shapes. Add faces with the writing tubes and make green-icing stalks. Place on the top of the cakes. These cupcakes will keep for up to 3-4 days in an airtight container. If you prefer, you could use ready-prepared decorations or make a simple cobweb design using the writing tubes. The chocolate icing can be made 2-3 days in advance, then warmed in the microwave or in a bowl placed over hot water, to soften again. To save time, simply melt chocolate and spread over the cakes instead of icing. Children will have fun helping to decorate these, but with a high sugar and fat content the cakes should only be eaten as a special treat.